number 9 for 2013 - tyler jamison - who is nicka smith? in spring 2011, i began work on the ancestral project. it was something new, something fresh, and something i had waited years to do. i had no idea that i would ever work with youth, or even in the way that i did through the program. one of those first sets of youth were a group of african american males lead by lamont snaer at berkeley technological academy. Young men from Lamont’s Snaer’s group at Berkeley Tech. Tyler is standing in the center with the black hoodie and beanie on. This photo appeared on the front page of The Oakland Post during Spring 2012.
one of the young men in that group was a funny kid named tyler. i remember he always had something witty to say and seemed to know a lot more about history than people would give him credit for. he always had a smile and hug for me whenever i saw him. I remember that he was photographed when the program made the front page of the san francisco chronicle. no matter where i was, whenever i saw tyler, he always spoke and checked in with me. unfortunately, due to life and it’s circumstances, tyler was murdered on february 9, 2013 in oakland. he was not the first one of my kids that has been shot, but he’s the first one that has died. he wasn’t a perfect kid. after reading the comments from a news stories covering the shooting, i’m left shaking my head. when i was in high school, there were two murders that i remember. both of them happened my sophomore year. one young man, todd mcglover, was shot when he opened the door at his home in a case of mistaken identity. the other, dennis swain, was even as horrific. he was found in the trunk of his car and shot multiple times. 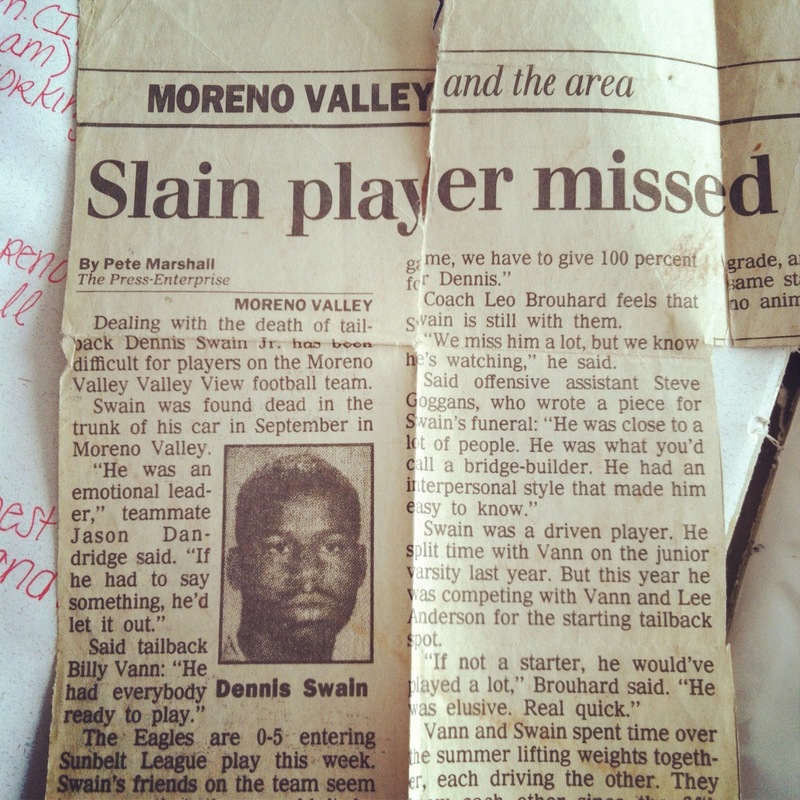 almost 20 years later, i still have one of the newspaper clippings about dennis. i remember i spent the night at a friend’s house and the morning we woke up was when we got the news that dennis had died. why am i sharing stories about stuff that happened in 1994? because some realness needs to be kept. i wasn’t raised in “the hood” or even the inner city. i was raised in the suburbs. yet, i STILL had classmates who were murdered and that was almost 20 years ago. while people sit and argue in comments on news stories, protest in the streets, or even call their elected officials, many of them are missing the point. they think that limiting the amount of ammunition is going to stop this. they think that doing more thorough background checks is going to end this. last time i checked, i have NEVER seen or heard of a gun shop in oakland. (the san francisco chronicle reports that the last one closed it’s doors in the year 2000!!!) in fact, i don’t even think there was one in the city i was raised in. yes, limiting ammunition and doing better checks may help, but when it comes down to it, these guns are getting out there outside of the means that a “regular” person would use to get one. the truth is, many americans are scared of day-day, pookie, and doughboy when recent events have provided more proof that you need to be just as concerned about adam, james, dylan, and christopher. my own mother recently remarked that anytime she’s at a school she is scanning to make sure she has an escape route just in case something pops off. doesn’t anyone else find it ridiculous that a retiree is doing this at spelling bees? so how do we fix “it?” to me, there are so many “its.” the roots to the violence are not being investigated or treated. folks keep throwing money at the “its” thinking it’s going to solve things but it’s not. one of the “its” is fixing the mental healthcare system. one of the “its” is providing jobs and opportunities (like training for tech jobs that the u.s. has not enough people to fill) for people living in areas that lack them so that they don’t have to rely on the drug trade. one of the “its” is calling a spade a spade and being honest about who your child is and what they are doing. do they need medication? do they need opportunities? how about just parenting a youth, even if it’s not your own? Tyler Jamison…eyes and smile, center. Pingback: who is nicka smith? number 32 for 2013 - donitra henderson » who is nicka smith? Tyler Jamison was my little brother. I’m just seeing this article for the first time but better late then never. I wanted to take the opportunity to say thank you for your kind words. Seems like just yesterday he was here and it’s still hard sometimes to fathom that he isn’t. Everyone is so quick to place blame but truth? there is no one to blame other than the people who did this. (Who by the way still haven’t been caught). Im starting to believe that our faiths are decided by god himself and although I would have never expected my little brother to die this way or this soon, how any of us will leave this earth isn’t our choice. Why things happen the way they do is something I will never understand. I imagined Tyler living a long life overcoming his obstacles. Often times id wish it were me instead of him.He has a beautiful baby girl who against all odds and with god willing will grow up happy, healthy and safe. Surrounded around people who love and will support her. Slowly but surely my family is finding peace in knowing that he is in a better place smiling down on us, our guardian angel. Pingback: The African Americans: Many Rivers to Cross – Episodes 5 and 6 – Researching Today, Right Now | who is nicka smith?